I attended my first MASIE conference in 2000 where I experienced a significant shift in my thoughts on career and what I wanted to be "when I grow up". I heard Tom Peters speak for the first time at that event (back then it was Techlearn) and what I heard was what I had been feeling, and known for years...no corporation will ever "take care of you". Me Inc. became my personal montra. Technology enabled the process even more when I discovered Web2.0 and I started this blog. It became very obvious to me that the internet was changing everything...again. I've spent the last 2+ years of my life embracing web2.0 and being an evangalist for Learning2.0 and all that includes. I've installed wikis, blogged, aggregated, flickr'd, Google'd, Presented, facilitated, taught, traveled and built inworld via Secondlife, and increased my global network of Learning friends significantly via social networking tools. Experiencing and engaging with Web2.0 has been an amazing experience in many, many ways. 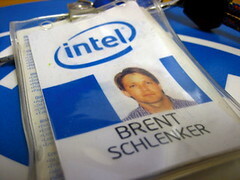 Leaving Intel is not hard for me. I have no regrets. (okay, maybe that I didn't leave sooner, but that's another post) Colleagues have referred to the workforce reduction as a bloodbath, and I'm sorry that it feels that way for so many. I'm looking forward to implementing new technologies, and learning strategies, and continuing to connect with the wonderful people in the learning industry. Hey Brent, good luck with the transition. I have been very much enjoying your vision on corporate elearning development and credit you for getting my interest going in eLearning 2.0. Looking forward to more posts! Keep up the good work! Brent - I am so excited for you!!!!! Finally, a chance to do what you love with no boundaries. You've inspired me to use these new technologies and have been the best cheerleader a noobie blogger could have. For purely selfish reasons, I hope you stay engaged in the Learning 2.0 realm. Good luck! I read Dan Pink's Free Agent Nation, just as I was leaving my last "job". It's been over three years and I don't regret it. There are different challenges as a free agent, but the freedom to choose is fantastic and it's led me down some interesting paths. Rightbrain you rock! I remember the article in Fast Company "The Brand Called You" way back in 1997 (http://www.fastcompany.com/online/10/brandyou.html). You have no worries - you have a strong brand - congratulations on your freedom and your courage. Let me know what I can do to help. Welcome to the club! It can be difficult at times, but in the long run its way worth it. Its independence for your brain! Wishing you well Brent. We all know you will be quite successful as a free agent and I hope Intel will regret the move as they will have to contract your services for ten times the price they paid you. Thanks too everyone! Really! The support is much appreciated. While I'm in transition I may be posting a little less, but I am definitely continuing the blog. I owe the ease of my transition to this blog and the amazing social networking tools of the web. The future is bright for sure. On the wall of my office I have a quote, "Nothing happens until you decide." (the source is Dr. Stanley Turecki) It has been my mantra as I do my own thing every day. Consider yourself empowered to decide . . . and then do amazing things! Good luck on the new free agent status, Brent! I'm sure it will mean great things for you, and that your impact in helping to push our industry forward will be felt even more now.